I do not want to turn into one of these foodies who insists on posting her dinner online every night, but … OMG, my mum’s homemade Vegan burgers are awesome! 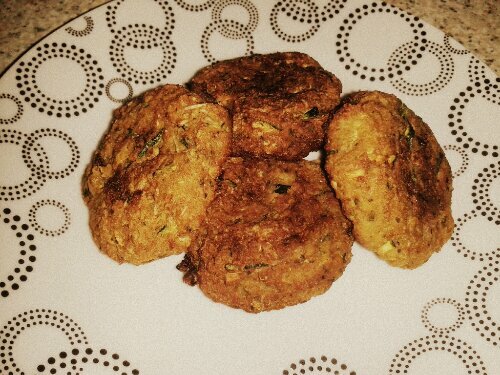 Made with all natural ingredients – veggies, homemade bread, herbs and spices – there are no meat substitutes in the recipe for these delectable patties. Best of all, they’re baked, not fried; so I’ve just scoffed three of them without feeling guilty! My fast for Lent began today, in accordance with the Greek Christian Orthodox calendar. I am now following a Vegan diet until Easter Sunday. Last week, in preparation for the fasting period, the church only permitted a meat-free diet. No fish was allowed, either – only seafood. I survived without my favourite meat dishes surprisingly well, although my cheese intake quadrupled! As a result, not everyone is convinced that I can go Vegan for 49 days, but I’m off to a great start. We weren’t allowed to consume any oil today – not even vegetable oil – yet I am stuffed with good food: an assortment of healthy yet delicious morsels prepared by my mother (who diligently fasts several times a year, as per religious guidelines). If every day is like today, seven weeks of Orthodox Lent should be an exciting culinary experience that may well become an annual event. I am enjoying the discovery of new food products and flavour combinations and feel rather inspired. Of course, it’s only the first day – and I may resort to cannibalism within two weeks if the meat-pangs kick in – but I’m quietly confident that I’ll complete my spiritual and physical cleanse without succumbing to sinful temptations. As winter gets colder, wetter and altogether gloomier, nothing warms the heart more than delicious food. The time for chilled sandwiches and salads is definitely over … rain showers and chilly winds disrupted October and November is proving to be just as dismal. If the thought of devouring greasy junk food or a bland ready meal for lunch makes your appetite plummet, take a short stroll from Tower Hill Station to St Katharine Docks. 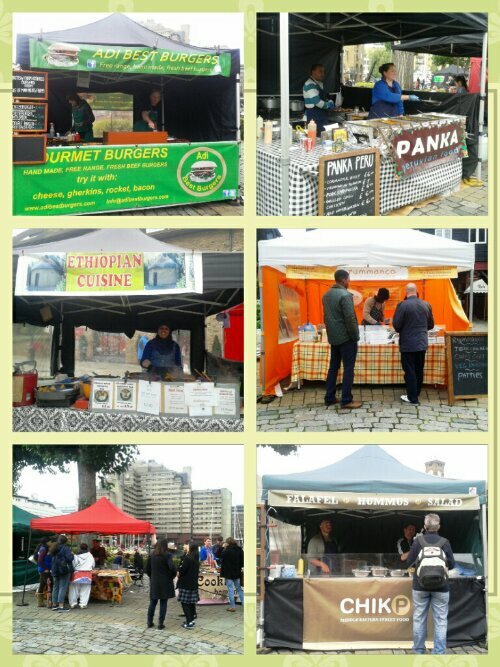 Every Friday, tourists, local residents and nearby office workers converge upon Marble Quay to sample and buy award-winning, gourmet dishes at street food prices from The Good Food Market. 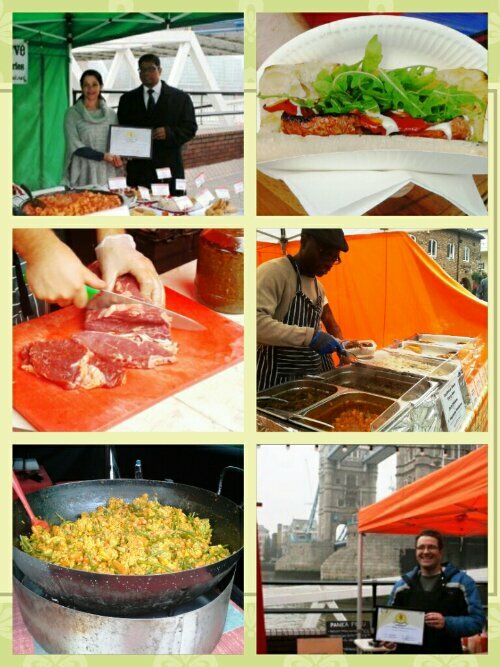 It’s the only market hosting traders in receipt of a coveted Tower Hamlets Food For Health award. Usually reserved for restaurants and cafés, the accolades can only be earned by adopting the rigorous standards required for healthy catering and overall nutrition. 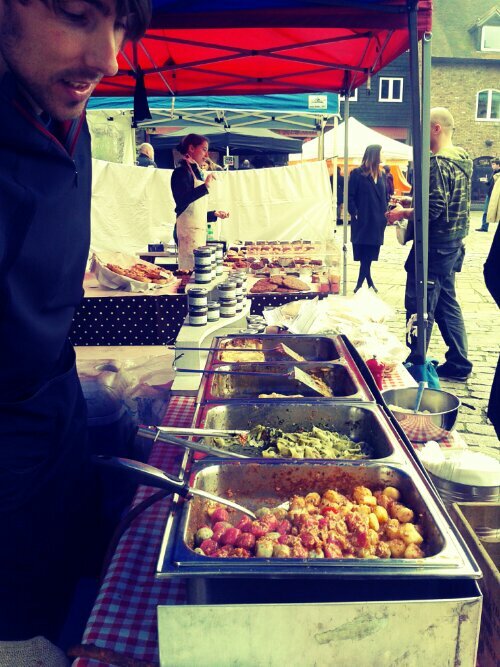 Prepared to strict hygiene laws and with an emphasis on wellbeing, the market’s dishes defy the boring image of healthy food in the UK – from Rummanco’s outstanding Jamaican Patties, Jerk Chicken and Curried Goat to the most tantalising, hearty Ethiopian stews from Redtent Enterprises. Try tucking into a delicious Palestinian Falafel Wrap from ChikP, crammed with tasty, vegan falafels with moist, fluffy centres. 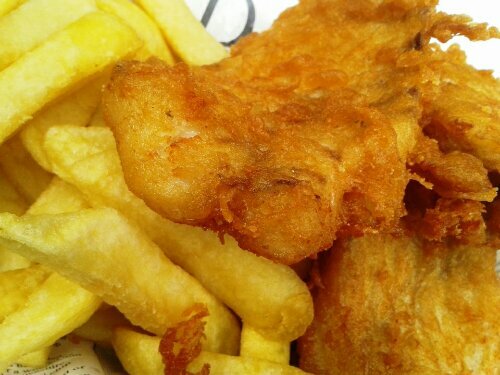 Alternatively, Adi Best Burgers make all their juicy patties with farm assured, British beef and Fins & Trotters – winner of the London Lifestyle Awards 2013 Street Food Vendor of the Year – serves up traditional Fish and Chips. Visit Panka’s stall for a taste of original Peruvian cuisine, or explore traditional Portugese fare instead, from Taste of Portugal. You can also opt for meat or vegetarian Paella – studded with mouth-watering, fresh ingredients – from Mediterranean Paella, or spicier Asian dishes from Fab’s Thai Cuisine. If you’re in a rush and in need of a quick bite, Chango creates moreish Argentine Empanadas with assorted fillings – easy to hold and devour without cutlery – or pick up a filled crêpe from Crepes N More. There are also Argentine Steak Sandwiches from Criollo Grill; Duck Confit’s self-titled speciality served in French bread; and a Famous Chorizo Sandwich, with roasted red peppers and rocket, from Gourmet Chorizo. Almost all hot food traders at The Good Food Market have earned a Food For Health award, with exceptions being newcomers who have yet to be assessed. The organisers of the weekly event, Shepherds Markets, take food provenance and nutrition seriously, so each trader is carefully vetted before approval to join the weekly line-up. Quality and taste are critical requirements, so it’s unsurprising that one of the latest additions is the Seriously Italian team, whose handmade pasta – produced with 100% British durum wheat – was honoured with a Great Taste Award earlier this year. With such an array of hot food that’s healthy, satisfying and flavoursome, gone are the days of struggling through a pre-packed sandwich or a bowl of lukewarm soup – just visit The Good Food Market every Friday to indulge in an award-winning, decadent lunch instead! 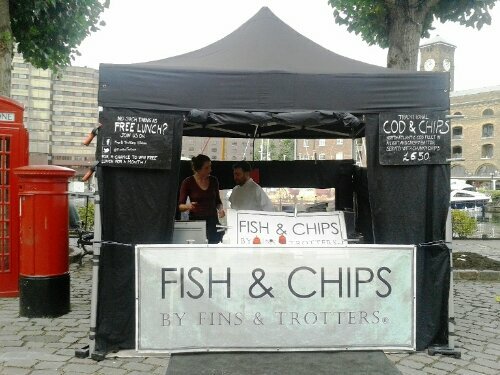 The Good Food Market takes place every Friday, from 11:30am until 3:30pm at Marble Quay, London, E1W 1UH. Shake out your tinsel and dust off your baubles; Christmas is finally upon us and we’ve got everything you need to make the festive season extra special! From December 11th to15th, you can head to More London Riverside where our More London Christmas Market will showcase the finest artisan food gifts and hand-crafted presents. With 20 different stalls each day, we’re bringing you more of everything you love at Christmas: more food, more entertainment and more unique presents! If you want to surprise your family and friends with exclusive gifts they won’t find on the high street, the More London Christmas Market is your one-stop shop! Fancy something inspiring for the kids? Make their faces light up with a handmade toy none of their friends will have – just one of many items available from our talented craftsmen. Need something luxurious for mum? How about a heaven-scented body cream or a beautiful pashmina (to keep her warm and on-trend this winter)? Hoping to transform turkey leftovers into appetising dishes? 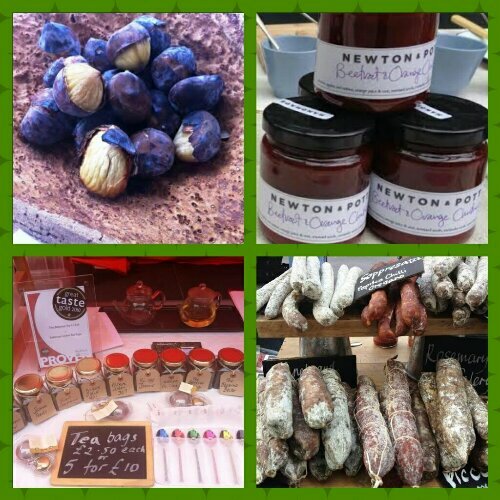 Try the delicious organic chutneys and sauces available from our amazing food traders. We know that shopping for friends who seem to have everything can be a nightmare but why not invest in an original painting or print from one of our art traders’ stunning collections? Alternatively, pull together a bespoke gift set or hamper with the aromatic oils, vinegar, speciality teas, honey and preserves on sale – a present for all the family! There will also be a range of Christmas stockings and cards to buy, as well as traditional Christmas cakes and puddings, helping you to create the perfect celebration at home. You can tuck into hot and cold dishes from around the world while you browse our food and craft stalls, or sip a cup of warming mulled wine with a crumbly mince pie or roasted chestnuts. Local carol singers will be on hand to perform all your festive favourites and even Santa has been persuaded to fly in for a visit! Entry is free, so there’s nothing “Bah! Humbug!” about this Christmas, only the true spirit of the season: supporting London’s most talented food and craft start-ups to bring you the finest gifts for family and friends. We can’t wait to see you at the More London Christmas Market and look forward to helping you make loved ones feel extra special. 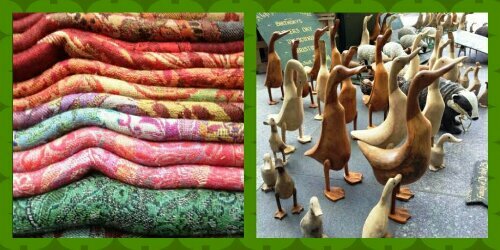 Visit the More London Christmas Market at More London, More London Riverside, London SE1 2DB, 11am – 6pm, from Wednesday 11th to Sunday 15th December 2013. One of the best lunches I’ve had in recent months was not in a Michelin-starred restaurant or within the welcoming decor of a much-lauded new café, it was devoured outdoors, quayside at St Katharine’s Dock. 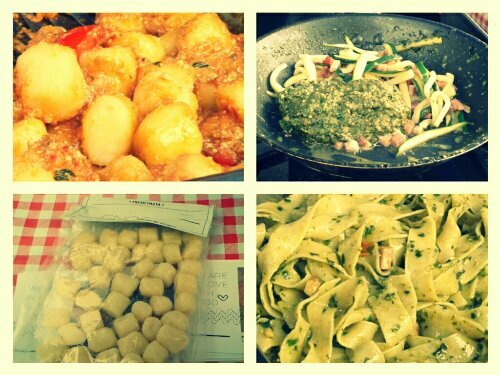 This wonderful meal took the form of three flavoursome pasta dishes from Seriously Italian‘s market stall. 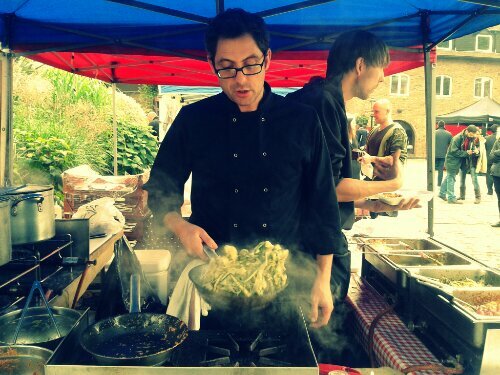 A regular fixture at The Good Food Market at Marble Quay (close to The Tower of London), the stall is run by a married couple from Italy and offers a selection of mouth-watering lunch dishes. Cooked on site, each carefully prepared dish features the couple’s handmade, award-winning, fresh pasta and homemade sauces (also available to buy should you wish to recreate similar meals at home). It was a pleasure to meet one half of the Seriously Italian duo, Giovanni, during my visit to The Good Food Market last Friday. His passion for cooking was evident and his approach towards his produce was inspiring: Seriously Italian is the only UK outlet producing pasta made from 100% British durum wheat. Even the gnocchi is made with British potatoes! Being artisan chefs, the provenance of their ingredients is key, sourcing the finest quality stoneground flour, organic certified produce and fresh vegetables to create not only hot dishes, but also packets of ready-to-cook pasta and jars of accompanying sauces. 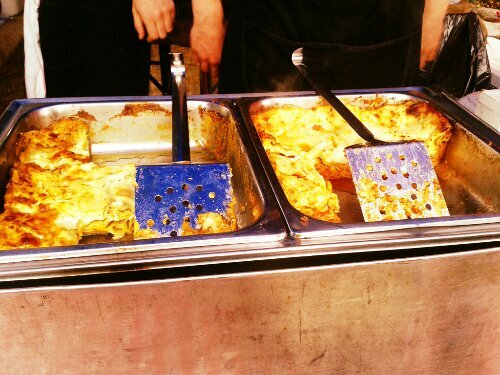 The stall offers three hot dishes each week, and I was lucky enough to sample all three available options during my visit, beginning with a combination of two types of plump, Organic Gnocchi – beetroot, and a spinach and ricotta. Tossed in a richly flavoured vegetarian red pesto, which looked deceptively like meat ragu, the gnocchi were perfectly cooked, with soft, fluffy centres melting against a mild heat of chilli in the sauce. Organic Parpadelle with Courgettes, Speck and Homemade Green Pesto was bolder and equally enjoyable. The vibrant sauce looked fresh and inviting and just one bite confirmed its superior quality. Fragrant with basil, the flavour was nicely balanced by bites of salty ham and al dente pasta. Whilst my first two pasta dishes were outstanding, it has to be said that Seriously Italian‘s Lasagne – made with pumpkin, sage and almonds – was nothing short of INCREDIBLE. The creaminess of the bechamel was worthy of a standing ovation for perfection, even without the addition of delicious sage-spiced pumpkin and fresh pasta. Sadly, I didn’t take a photo of my box of assorted pastas – I was too busy shovelling enthusiastic forkfuls into my mouth! Whilst I chewed and sighed with pleasure (it was a bit When Harry Met Sally but I really couldn’t help myself), I wasn’t surprised to learn from Giovanni that Seriously Italian‘s pasta was honoured with a Great Taste Award earlier this year. Well deserved, believe me! Unable to wait an entire seven days until The Good Food Market‘s return to Marble Quay the following week, Giovanni kindly gave me a jar of his homemade Pistachio Pesto to continue my Italian adventure at home – an outstanding concoction which transformed an otherwise bland bowl of Sainsbury’s penne into a gourmet meal. Overall verdict? Seriously Italian could easily be renamed ‘Seriously Good’! It’s a five star lunch in a five star location – a beautiful marina, brought to life with authentic Italian food, hospitality and warmth. 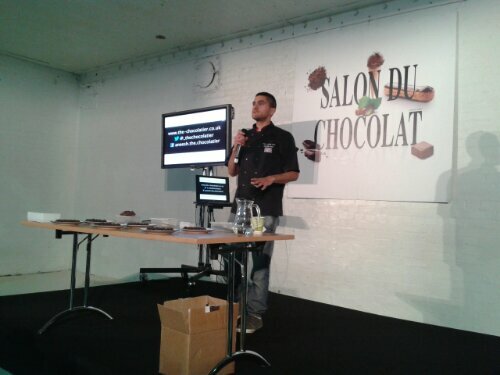 One of the highlights of Salon du Chocolat‘s London debut was Aneesh Popat’s impassioned talk and tasting session, introducing his exquisite chocolates and ganaches. Applying chemistry to his art and challenging tradition – much like a certain Mr Blumenthal – Popat has quickly made a name for himself with his unorthodox techniques and experimental flavours. 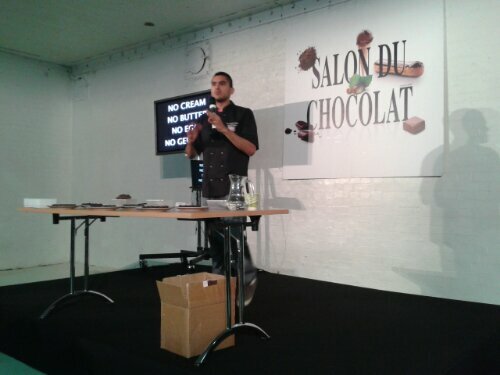 “Chocolate is a superfood and we should eat it everyday!” proclaimed the artisan chocolatier during his fervoured presentation – immediately gaining my approval and agreement. Not that I need any encouragement to partake in a daily chocolate fix: I’ve had that one down pat since I was seven! However, I now have a reason to feel less guilty… Under the brand name of The Chocolatier, Popat produces his critically-acclaimed confectionery without any cream or butter – making them far healthier alternatives to other chocolates on the market. Able to produce the most velvety creations using only chocolate and water (the trick is in the emulsification process and the generation of small particles), Popat’s dairy-free treats contain approximately 40% to 50% less calories than traditional chocolate. Depending on if you’re a glutton or a weight-watcher, you can choose to eat twice as much or stick to a healthy diet. I’m Team Glutton all the way! Despite these vegan roots, the omission of dairy in no way impairs the flavour or quality of Popat’s chocolates or ganaches (believe me, my palette can detect even the slightest flaw within my fix of chocolate). In fact, so delicious are these dairy and gelatine free truffles, it’s not unusual to find them being showcased within Michelin-starred restaurants; a testament to the quality and flavour of The Chocolatier range. Surprisingly, Popat isn’t from a science or food background … the former Mathematics graduate (he earned his degree at Nottingham university) went on to study Philosophy, in India, before returning to the UK to launch The Chocolatier, only two and a half years ago. Pining for Fir Tree Truffles (sorry, I couldn’t resist the pun)? 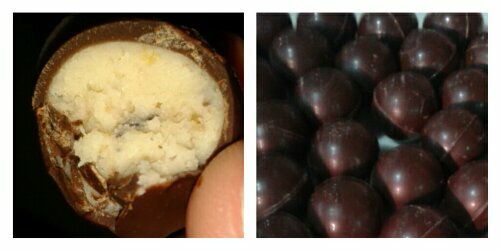 Or how about a delicious Baked Bean Truffle instead … all the flavour but without the gas and bloating afterwards? Popat produces these unconventional truffles using no more than chocolate, water, fruit or vegetable purees, herbs, spices and lots of science. Incidentally, the Fir Tree Truffles were flavoured by obtaining a pine tree, removing the needles, boiling them and capturing the aroma (steam) to infuse with the chocolate. I told you the dude liked chemistry. For the tasting session at Salon du Chocolat, Popat presented three unique flavours to sample, beginning with a smooth, sensuous Raw Coconut Bean which, Popat revealed, wasn’t tempered above 42 degrees to ensure its delightful texture and flavour: another nugget of science for you. 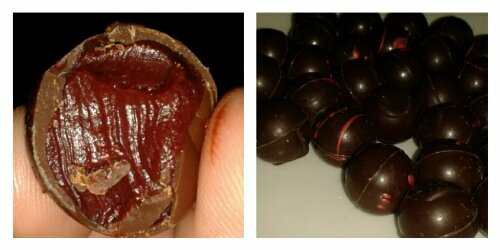 Our second treat was an eye-wateringly acidic Beetroot, Red Wine Vinegar and Hazelnut ganache (the first bite was mild but the second packed one heck of a punch). All the flavours came through in stages, unfolding like a three course meal, reminiscent of Willy Wonka’s bubblegum – quirky and definitely fun! To finish, we devoured a marvellous Mince Pie Truffle, produced with an actual Mince Pie (pastry included) and caramelised banana ganache – a triumph and my favourite treat of the day! Provenance, of course, is paramount to The Chocolatier and his ingredients are all carefully sourced, including working with chocolate brand Duffy’s original beans to produce a truffle especially for Salon du Chocolat. I would’ve expected nothing less from such a master of chocolate. Quirky, fun, decadent and healthy, The Chocolatier‘s confectionery deserves to be on any Christmas wish list this December. It’s the ideal gift: you can eat them as an indulgent treat during the festive period or hold off until January, when you’re trying to lose the extra kilos you’ve gained from troughing through all that turkey, stuffing and cake. 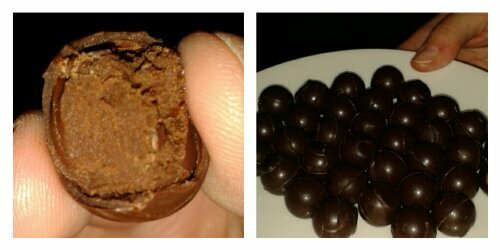 Now, it’s not often I get to say that about chocolate!